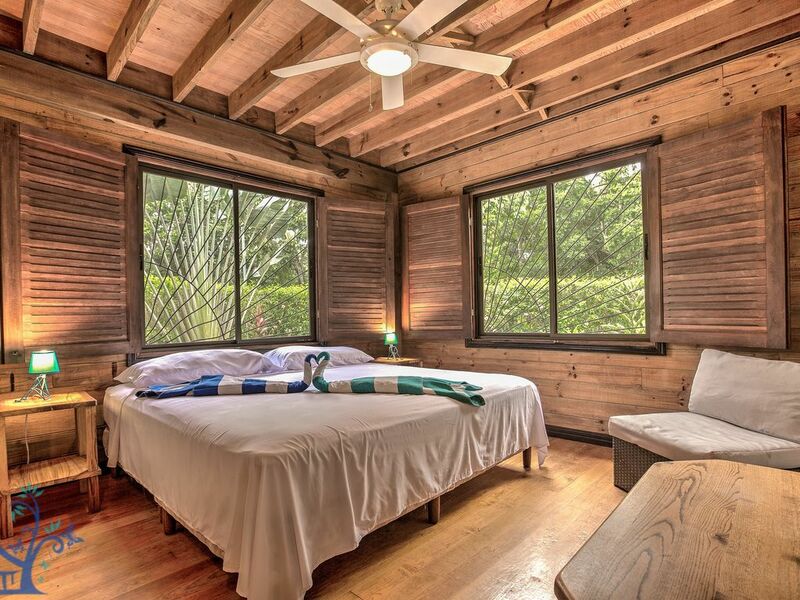 Villa à Puerto Viejo qui possède 3 chambre(s) et Capacité pour 6 personnes. Logement de 200 m² ammeublé avec goût et moderne. il est situé dans une zone idéale pour familles et entourée du bois.Elle dispose de jardin, mobilier de jardin, clôture, 20 m² de terrasse, alarme, parking extérieur (2 places) bâtiment proche, 4 ventilateurs.La cuisine américaine, de gaz, est équipée avec réfrigérateur, congelateur, vaisselle/couvert, ustensiles/cuisine, cafetière et presse-agrumes. We loved the property ! Location was amazing . Close to beach ! We rented bicycles and it was about an 8 minute bike ride . Only inconvenience we had was not enough towels for the week stay . Lol ! We had to do laundry . All and all we loved the property! Need a lot of work. Would not recommend. It was one good thing about that house. It's proximity to the very quiet and beautiful beach. Communication with the office was almost flawless. Still waiting for the refund of the deposit. The house is spacious, was clean when we arrived. -Needs a new AC, smells like urine when it works; has some broken parts. -Needs new lights at the main level; cleaning of fans. Very dark at night. Some light fixtures hanging on the wires. It is a safety hazard issue. -No TV or DVD player. -One of the closest had dirty linens from previous stay. It had electric panel open with wires hanging out. -The fridge has some issues. It is very loud and freezes products even at the bottom. -All linen was old and had stains. Mattresses are very firm and old. -The low level shower did not have enough water pressue to take showers. The plastic shower base has a crack. I guess some water goes through the floor all time. -Walls need some paint. Stains and scratches are everywhere. -The internet is very slow because of a super cheap tiny modem and USB wifi stick. I had to use my phone all time. -There is no way you can use the outside of the house. Water stays around the house after rains and tons and tons of mosquitos are everywhere. It is a real problem there. Many thanks Andrew for your review. We really take into consideration comments from guests as it is the only way to get better. Our cleaning, maintenance and gardening teams are already on that! Regarding the refund of the security deposit, the amount was blocked on your credit card and then was cancelled 3 days after your check-out so there is no real refund on your bank account. Also, The house has a basic internet which is quite stable (nice in the jungle) and enough speed for basic activities. As I told you while you were here, we do have a lounge at the office where you can get free high speed wifi. Puerto Viejo de Talamanca est la ville principale de la région. Son activité principale est le tourisme et l'agitation de la ville est inconnue, plus au sud. Vous pouvez trouver plusieurs supermarchés, restaurants, bars, discoth��ques, m��decins, pharmacies, bureau de poste et les banques. Réputés par les internautes à travers le pays, Salsa Brava est le célèbre spot de surf. Un marché bio est ouvert tous les samedi matin, �� partir de 06h00, juste derrière la Casa de la Cultura. Ses produits sont excellents et peu coûteux. Rates are based on minimum 2 person occupancy. Higher rates will apply for additional persons. Please inquire for an accurate rate based on number of people and time staying.